Very often, the real world is essentially weird. Sometimes, too, it aligns with weirdness in fiction. If I were to tell you of a statue made from a material originating in outer space, carved by an unknown artist in an unknown time and place, and depicting an unknown figure, would I be describing fact or fiction? Or maybe both? The figure . . . was between seven and eight inches in height, and of exquisitely artistic workmanship . . . . Its vast, awesome, and incalculable age was unmistakable . . . .
[O]f unknown age [and] carved from a rare class of space rocks known as ataxite meteorites . . . . the statue is about 9.5 inches tall and weighs about 23 pounds. 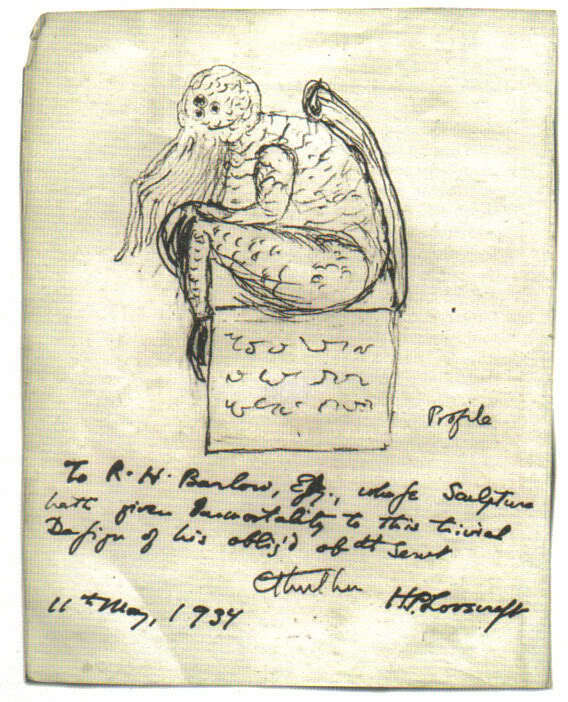 The first passage describes the statuette of Cthulhu from "The Call of Cthulhu." 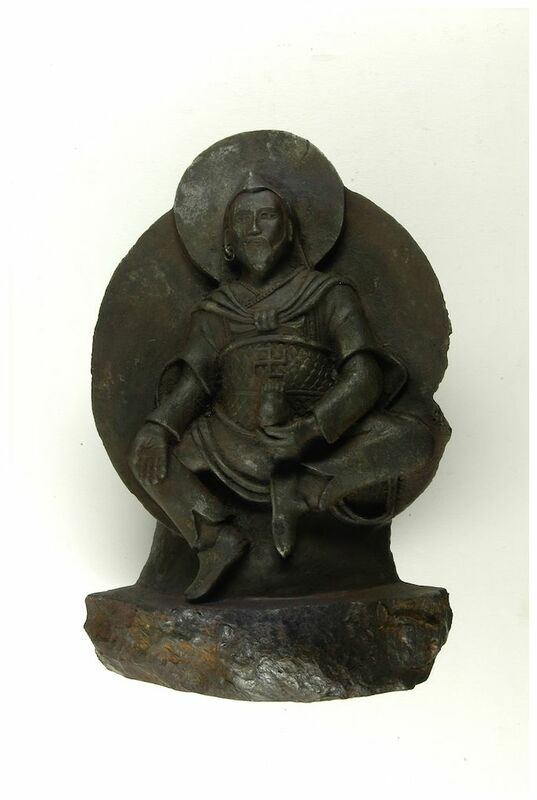 The second describes a recently identified "space Buddha," a statue studied by German scientists and supposedly described in an online journal called Meteoritics & Planetary Science. (My brief attempt to find the journal turned up nothing.) You can read more in the original Yahoo "news" story, "Nazi-Acquired Buddha Statue Came from Space" by Stephanie Pappas, here. Update (October 25, 2012): An update from Yahoo "news" on the statue from outer space questions its supposed antiquity. It turns out the statue may actually be a twentieth century artifact--still carved from a meteorite, but still perhaps no older than your grandmother. You can read more in the article "'Space Buddha' Statue May Be a Fake" by Stephanie Pappas, here. "'It's a rotten world . . . . [f]it for another morbid growth of superstition. It's time the ghosts, or whatever you call them, took over and began a rule of fear. They'd be no worse than men.'" If you want a good scare before going to sleep tonight, read Fritz Leiber's short story "Smoke Ghost." Published on the eve of America's entry into World War II, "Smoke Ghost" is set in a modern, industrialized city, a place filled with smoke, grime, soot, and cinders. I won't give too much away, but in this story from early in his career, Leiber clearly engaged himself in solving the problem of the weird tale, namely: How does the writer in a genre that is essentially Medieval in nature (rural, insular, supernatural, irrational) update that genre for a new age? The old-fashioned Medieval or Gothic ghost--draped in its shroud, dragging its clanking chains, haunting its lonely graveyard or empty castle--was long gone by 1941. But because there must be ghosts or "whatever you call them," the modern, industrialized city gives birth to a different kind of supernatural creature, embodied in the "Smoke Ghost" of the title. The protagonist of the story, Catesby Wran, explains to his secretary that there aren't any more ghosts. "Science and common sense and psychiatry all go to prove it." Yet men are still haunted. Wran concludes that far from being nonsense, "superstition [is] only a kind of wisdom." The view from the elevated train Wran uses offers him a view of "a dingy, melancholy little world of tar-paper, tarred gravel, and smoky brick," a view that comes "to symbolize . . . certain aspects of the frustrated, frightened century in which he lived, the jangled century of hate and heavy industry and total wars." From this landscape arises a new kind of ghost, the spirit of the urban, industrialized landscape, a spirit sated by recognition, obeisance, and worship--if only for awhile. And the century wasn't even half past. In "The Inheritance," Leiber continued with the theme of the monstrous city, describing it as "dingy," "dismal," "lightless," "nervous," "ugly," "crowded," and full of criminals and murderers. Like a story by Lovecraft (one of Leiber's mentors), "The Inheritance" is one of loneliness and isolation, a Gothic tale set in a desolate, twentieth century rooming house and in the dream-state of its protagonist. The monster turns out to be of a kind all too familiar to us today--and not from fiction but from real life. Bret Easton Ellis had a name for it: "American psycho." Werewolves? He had read up on such things at the library . . . but what he had read made them seem innocuous and without significance--dead superstitions--in comparison with this thing that was part and parcel of the great sprawling cities and chaotic peoples of the Twentieth Century . . . . Meanwhile, what's happening inside each one of us? I'll tell you. All sorts of inhibited emotions are accumulating. Fear is accumulating. Horror is accumulating. A new kind of awe of the mysteries of the universe is accumulating. A psychological environment is forming, along with the physical one. Our culture becomes ripe for infection. From somewhere. It's just like a bacteriologist's culture. . . . . Similarly, our culture suddenly spawns a horde of demons. And, like germs, they have a peculiar affinity for our culture. They're unique. They fit in. You wouldn't find the same kind any other time or place. The dark spirit of the city, the psychopath, the evil and murderous dictator, the hound of the imagination--where do these twentieth century monsters come from? Fritz Leiber, through his narrators and protagonists, offered as good an answer as any. Forces are at work that break people up, and scatter them, and make them lonely. You feel it most of all in a big city. Certainly a person without family, friends, or proper occupation is liable to mental aberrations. And it seemed to me that social, economic, and physiological factors, even Death and War, were insufficient to explain such anxiety, and that it was in reality an upwelling from something dubious and horrible in the very constitution of the universe. The Medieval and the Gothic may have been inadequate in the twentieth century, but the Middle Ages did not give birth to monsters. The people of the Middle Ages had monsters fitting for them and their times. So did the people of mid-twentieth century urban America. And so have the people since and all those to come. Monsters have always been with us and probably always will be, though behind an ever-changing disguise. The root of the word "monster" is from the Latin for "warning." If we are to exorcise monsters, we have to see through the disguise to the warnings our monsters bear about ourselves and our society. Note: At five long parts, "Fritz Leiber and the Problem of the Weird Tale" is more than a blog should bear. Thanks to all readers who have been patient enough to wait for and to read what I have written here. Thanks also to the author of the blog "Good Short Fiction to Read" for the genesis of this article. Item No. 1: The last episode of Star Trek to be broadcast in its original run was a repeat of "Requiem for Methuselah." (The date was September 2, 1969.) The last word uttered in that last episode? 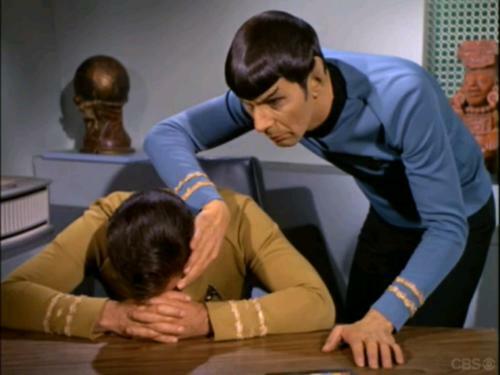 Spock tells Captain Kirk, "Forget." Could that have been a message to fans of the show at the end of its run? After all, they were in as much pain as Captain Kirk at the loss of the woman he loved. 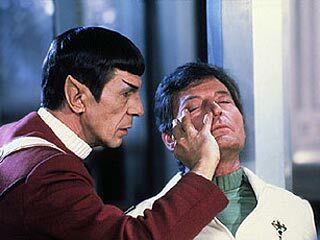 Anyway, in a parallel scene from The Wrath of Khan (1982), Spock tells McCoy, "Remember," thereby setting up the next two movies. Item No. 2: Six days after the broadcast of "Requiem for Methuselah," Star Trek made its debut in syndication. The date? Forty-three years ago today, on September 8, 1969. So today is actually a double anniversary. I have called this posting "Weird Tales and Star Trek," but the connection between the two is actually pretty tenuous. Although it wasn't the first pulp magazine, Weird Tales was the first American magazine devoted exclusively to fantasy fiction. Subtitled "The Unique Magazine," Weird Tales made its debut in March 1923. The first science fiction magazine--Hugo Gernsback's Amazing Stories--didn't come along until April 1926, by which time "The Unique Magazine" had already printed its first science fiction story, before the term had even been invented. I can't say what that story would have been, but "Ooze," the cover story for the first issue, is a good candidate. In any case, in April 1925, Weird Tales published a story in which the crew of a spacecraft, using sensors to detect a potential problem on a nearby planet, flies to that planet and rescues its helpless natives by destroying a race of monstrous invaders. (The weapons used by the crew of that spacecraft are some sort ray gun. In the story, they are called "blastors.") That sounds an awful lot like the plot for an episode of Star Trek. Instead, it describes the main action in Nictzin Dyalhis' story "When the Green Star Waned." (1) Nineteen sixty-six was a peak year for pop culture in America. In addition to Star Trek, Batman, Dark Shadows, The Newlywed Game, The Green Hornet, The Monkees, The Girl from U.N.C.L.E., Mission: Impossible, and The Hollywood Squares also made their debut. The Beatles released what is arguably their best album, Revolver, while Simon and Garfunkel, Bob Dylan, The Beach Boys, The Byrds, and other groups also released key albums. That was also the year of a UFO flap and of the first sightings of Mothman. By the way, one of the songs on The Byrds' Fifth Dimension (1966) is called "Mr. Spaceman," about space aliens. (2) They were probably based on a very earthly animal, the guinea pig. 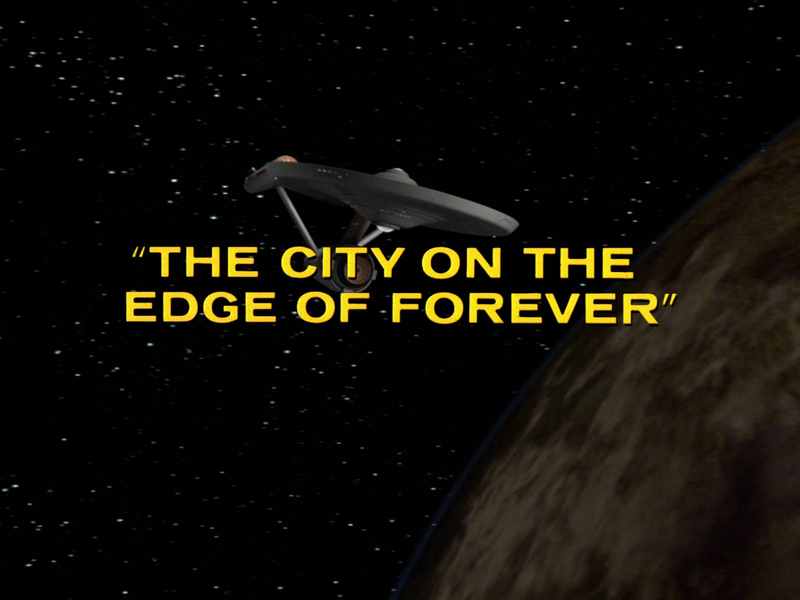 (3) Jerome Bixby wrote "Requiem for Methuselah" as well as three other episodes of Star Trek. (4) "A Piece of the Action"--the gangster episode--is actually set on another planet. 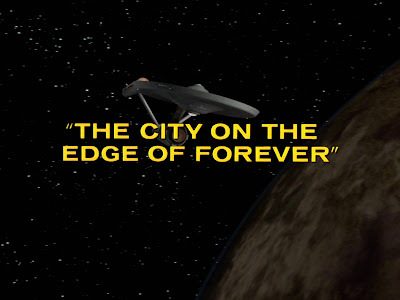 (5) "The City on the Edge of Forever" is a kind of bridge between the science fiction of the past and of the future in that the Guardian of Forever is a forerunner to Stargate. I have mentioned guinea pigs and Stargate. The person who pointed out that today is an anniversary will be happy. 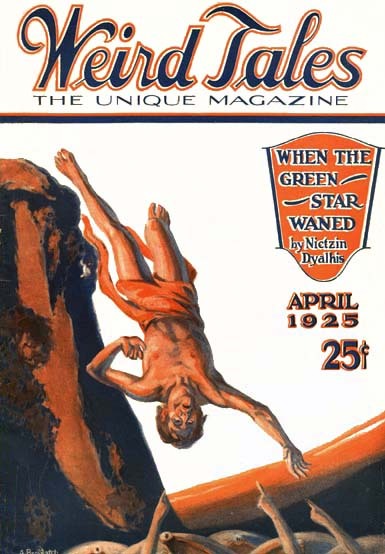 Weird Tales, April 1925, with a cover story, "When the Green Star Waned" by Nictzin Dyalhis. It was one of the first tales of interplanetary travel or of science-fantasy to appear in "The Unique Magazine." Star Trek followed in the tradition of science fiction, science-fantasy, and weird fiction pioneered in pulp magazines. It's ironic that "forget" was the last word spoken in the original run of the television series Star Trek. These stories appear in the book almost in chronological order of their first publication. The exceptions are "Smoke Ghost," which is put to good use as the opening story, and "The Hound," a story very similar to "Smoke Ghost" and therefore perhaps purposefully separated from it by several intervening tales. All but "Diary in the Snow" were published during the war years. The remaining stories betray a feeling of anxiety, dread, and despair that must have pervaded the world between 1939 and 1945. All but "The Hill and the Hole" and "Diary in the Snow" take place in the city. Despite their rural setting, even those stories are modern (as opposed to Medieval) in that they include elements of science fiction and disturbing twentieth-century anxieties. Throughout the 1930s, the world moved inexorably towards war. The fantasies of the Depression Era, whether authored by Busby Berkeley or H.P. Lovecraft, must needs have retreated as armies advanced. During his own writing career, Lovecraft had advanced the weird tale from a Dunsanian fantasy or a Poesque Gothic romance to semi-science fiction. You could argue that his best and most accomplished works--"The Call of Cthulhu," "The Whisperer in Darkness," "The Dunwich Horror," "At the Mountains of Madness," for example--are a fusion of those three forms. However, Lovecraft--an inhabitant of his own very real Gothic landscape--was essentially conservative, even reactionary. Few of his stories are set in a recognizably modern world where people go to movies, read magazines, talk on the telephone, carry on love affairs, or trudge off to work every day. A key element of the Gothic tale is physical isolation, usually in a remote place peopled (if at all) by rural characters, most of whom are simple, superstitious, even backwards. Anyone who has read Lovecraft's stories is familiar with the setting. On the other hand, the city and its worldy, sophisticated inhabitants play only a minor role in his work. Significantly, when he set one of his tales in the city, he described it as a place of horror, "a horror beyond all human conception--a horror of houses and blocks and cities leprous and cancerous with evil dragged from elder worlds." (1) Lovecraft knew whereof he wrote, for he lived in New York City for two years between 1924 and 1926. Still, his prose is a little overwrought, his sentiment a bit of an abstraction. You get the feeling that his revulsion at the city had more to do with his fastidious, small-town waspishness than true modern anxiety. It would take someone like Chicago-born Fritz Leiber--who also called New York, Los Angeles, and San Francisco home in his lifetime--to write more accurately, concretely, and effectively of the horrors the city had to offer. H.P. Lovecraft died a year almost to the day before the Anschluss. The world was slouching towards war by then, but there was still time in the mid-1930s to enjoy the fantasies provided by American popular culture. The song from the closing of the First World War went like this: "How 'ya gonna keep 'em down on the farm after they've seen Paree?" You might ask the same kind of question about World War II: How does fantasy--which relies so heavily on isolation from the real world--survive when its authors and readers are so violently thrust into that same world, a world in which the truest and most horrifying monsters are human beings? Cthulhu is a scary monster, effective as an artistic creation because, being based in a material, scientific universe, he is made more real. Vampires and werewolves may also be scary, but they are creatures of an earlier time, when the supernatural was a part of everyday life. (2) The vampire, the werewolf, the witch, and the ghost of the Middle Ages have been replaced in our modern age by the psychopath, the cryptozoological creature, the space alien, and the android. Put another way, the supernatural has been replaced with the "natural," that is, the material and the scientific. Alternatively, the twentieth century monster is generated in the mind, its breeding ground, the city, with all its isolation and alienation. "Each culture creates its own ghosts," says a character in Fritz Leiber's story, "The Hound." So what kind of ghost haunts the modern world? I hope I can answer that question and conclude this ramble next time. (1) From "The Horror at Red Hook." (2) The only truly fearsome monsters of the twentieth century were real and psychopathic: Fritz Haarmann (1879-1925), "The Vampire of Hanover," and Peter Kürten (1883-1931), "The Vampire of Düsseldorf," for example. There were countless others, called "Beasts," "Killers," and "Rippers," among other things. There were of course political monsters as well, mostly socialists and other assorted true believers, such as Hitler, Stalin, Mao, and Pol Pot. As for twentieth century werewolves--again, real, and again, German: as the defeat of Nazi Germany drew near, Joseph Goebbels announced plans for a commando force that would operate behind Allied lines. As with their supernatural counterparts, Nazi Werewolves proved more of a legend than a reality. In his book of the same name, Carl Sagan described the pre-scientific world as a "demon-haunted world" and science as "a candle in the dark." What was that demon-haunted world like? We can hardly imagine a culture in which few ventured far from home and everyone was fixed in his or her predetermined place in the world. There was little mobility and little privacy. Psychological isolation and alienation may well have been rarities. It was primarily a rural culture and lit only by sun, moon, stars, and its own small fires. It was one in which machines were simple and powered only by people, animals, wind, and water. When night fell, the world would have been dark and quiet beyond our imagining. Most importantly, the Middle Ages were a time in which spiritual and theological concerns were paramount. The supernatural was part of the fabric of everyday life. The demon, the undead, and the monster were not simply bits of fiction. They were real and frightening. They were afoot in the world, lurking on the edge of the firelight, in forest and fen, in the swamps and the depths of the sea, in distant terra incognita, and in the dark, gloomy ruins of previous civilizations. That world was brought to its own ruin by the forces of modernity: science, reason, humanism, democracy, urbanization, mechanization, industrialization. Those same forces slew all the supernatural beings that inhabited the Medieval world. Ghosts, demons, and other Medieval creatures survive only in tales that give us the shivers but are soon forgotten as we nod off to sleep and awaken to our daily lives. Those inventions of the Medieval European imagination "can't take root in the new environment," as Fritz Leiber wrote. Brownies, fairies, pixies, and gnomes; trolls, giants, unicorns, and chimerae; ghosts, angels, demons, and the undead--none has gained much of a place in the American mind. We have created our own folklore to be sure, populating it with creatures from tall tales, pranks, hoaxes, and commercial schemes. Scooby-Doo! may be more significant than we think. Even then, we haven't taken our own creations very seriously. (3) We're too practical and worldly, too busy in the hustle and bustle of our lives. Nagging questions remain, though: Where do monsters come from? Is there a need for them somehow? In the movie Forbidden Planet, Morbius, played by Walter Pidgeon, offers one answer: Monsters come from our subconscious minds. Every era breeds its own monsters because people will forever be plagued by fear and anxiety, by dread and despair. The Middle Ages may have come to an end, but fear and anxiety will always be with us. You might say that they have only proliferated in the modern world now that the certainties of the Middle Ages have been extinguished. "Each culture creates its own ghosts," as Fritz Leiber claimed. So what are the ghosts of the twentieth century? I'll write more about that in Part 4 of "Fritz Leiber and the Problem of the Weird Tale." (1) From "The Hound" (Weird Tales, Nov. 1942). (2) Some exceptions: classical myth, tales of the Orient, and maybe science fiction. There are probably others. I welcome comments and other opinions. (3) More exceptions: The supernatural creature of Medieval Europe has been supplanted in the United States by the "natural," biological creature that falls within the purview of science. Bigfoot or Sasquatch is said to be an identifiable and describable species of hominid, studied by university professors of anthropology. Aliens from space are also said to be biological or technological in origin. Nevermind that they serve more or less the same function as the angels, demons, and little people of Medieval Europe. Perhaps the most distinctly American monster is the psychopath, the only true monster. In the Middle Ages, he would have been called a werewolf or a vampire. Today he is a person suffering from errant brain chemistry, genetic mishap, or psychological trauma. All of these uniquely American monsters find their origins in science, pseudoscience, or science fiction.